Another Enceladus encounter- the fourth (and last) for this year! It’s become tempting to think of these barnstorming flybys as routine, and to forget how extraordinary they are. Here we are, on one planet in this amazing solar system, flinging this wonderful machine with exquisite precision between the moons of another planet so far away. This flyby (as show in the illustration), on orbit 91, doesn’t come quite so close to Enceladus as the last three, so we won’t be penetrating the plume so deeply as we’ve been used to recently. That’s OK, because our focus this time is on remote sensing-we’ll be getting images and spectra of the active south polar region comparable in detail to the gorgeous data we obtained from our August 11th, flyby. Originally the October 31st flyby had been planned for a 2,000 kilometer (1,245-mile) altitude, but we moved it down to its present 200 kilometer (120-mile) altitude so we could get a closer look at the surface. We can’t image the surface from 200 kilometers away- we just can’t rotate the spacecraft fast enough to keep track of Enceladus from that range. Instead, our goal is to lock onto Enceladus as soon as we can after the flyby, when we’ll have another good view of the south polar region. The closer we fly to Enceladus, the more quickly the direction to the moon stabilizes as we recede, and the sooner we can track it. Imagine trying to read a billboard from a speeding car-it’s a lot easier to read (if you’re not driving!) when it’s receding in your rear view mirror than when you’re passing it. 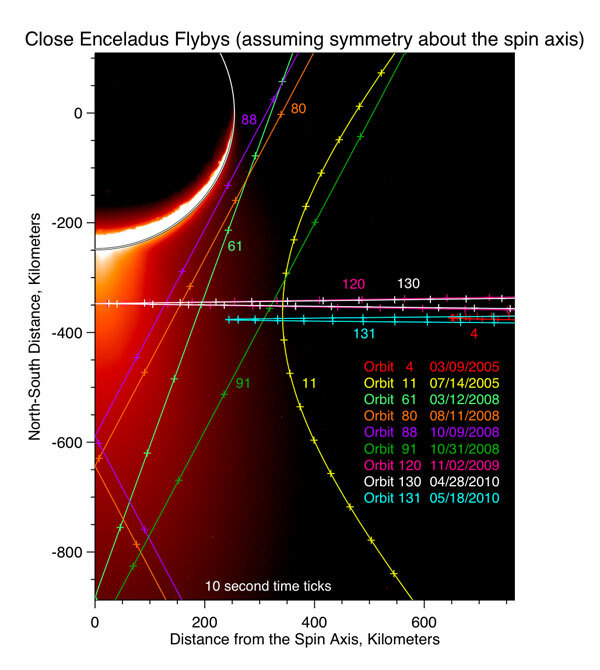 Image above: This diagram shows the trajectory of Cassini’s closest Enceladus flybys from the Prime and Equinox missions, relative to the south polar plume, which is shown in false color based on an image taken by the Cassini cameras in April 2007. Flybys on orbits 3 and 121 do not come quite close enough to Enceladus to appear on this graphic. Our own instrument, the Composite Infrared Spectrometer (CIRS) will once again be mapping the heat radiation from the warm tiger stripe fractures, trying to understand how hot the fractures are, and exactly where the heat is coming from. We only had time to map a small fraction of the active fractures from close range in August, so this time we’ll be looking at different regions, in cooperation with the imaging camera and the ultraviolet spectrometer which will be observing simultaneously for much of the time. We’ll be following up on some of our August 11th discoveries. Back then, we got a beautiful spectrum of one of the most active regions of the fracture Damascus Sulcus, allowing us to make some precise temperature measurements. We’re really interested in the temperatures, because the warmer the fractures are on the surface, the more likely it is that liquid water lurks somewhere below. The highest temperatures we saw, 167 Kelvin or -159 Fahrenheit, were a bit lower than we had estimated from our less precise data from the March 12th flyby (at least 180 Kelvin or -136 Fahrenheit), though both numbers are dramatically warmer than we would expect at this time of year if internal heat wasn’t leaking out of Enceladus (roughly 60 Kelvin or -352 Fahrenheit). Whether the Damascus fracture has really cooled since March, or whether our March measurement was an overestimate, or some other factor explains the discrepancy, is one of the things we’re still puzzling over, and maybe this week’s data can help us sort that out. Another thing we’ll be doing is measuring the total amount of heat energy coming out of the south pole. Knowing the total horsepower of Enceladus’ heat engine is crucial for understanding what’s driving the activity there. We’re pretty sure the deformation of Enceladus by Saturn’s tides is the ultimate power source, but so far none of the theorists have been able to explain in detail how that source can continuously supply the roughly 6 Gigawatts of power that CIRS is seeing. So we’ll be trying to refine that power estimate on this flyby. Whether the new observations will make life easier or more difficult for the theorists’ remains to be seen! Perhaps there is some sort of fusion reaction taking place in the core. The internal mechanisms behind such a small planet that can generate that kind of power are unheard of. I’m no physicist so I will leave it in your capable hands before conspiracy theorists start saying the planet is actually an alien space ship. That was Superbmination, Thanks … !